Viewrail looks just as home out of doors as it does in them. This customer used stainless steel railing and cable to wind down a stairway at a series of non-standard angles. Fortunately, this isn’t a problem at all as you can see the simple, continuous look that Viewrail created. We’ve designed out cable railing system to be ideal for unique applications. If you have a non-standard project, just let us know! We’re happy to look into how we can adapt our system to fit your needs. Email orders@stairsupplies.com, or give us a call at 1-866-226-6536. We’ll make sure a representative connects with you to discuss your cable railing project. 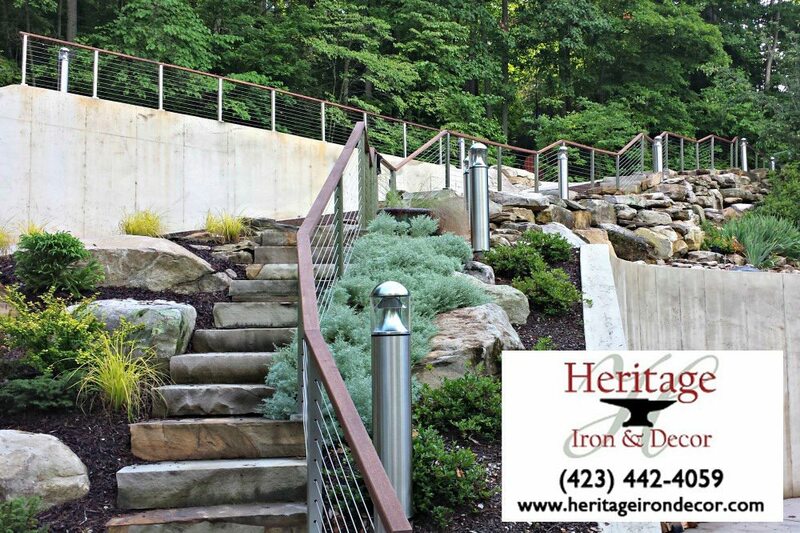 These posts were manufactured and installed by Heritage Iron & Decor in Madisonville, Tennessee. They installed the system using StairSuppliesTM Cable Rail fittings and cable.